select the suite that best compliments your wedding style, and personalize the details with your own wording, envelope color, ink color and printing method. within 7 business days, you will receive your first digital proof. This is your opportunity to make any minor changes to the wording, calligraphy and/or text. Each additional revision round will incur a $50 charge. once you have approved your suite for print, it will be sent to the printer. Typically it takes about 3 weeks to print your suite, and 2 weeks for calligraphy and assembly. upon completion of printing and assembly, your suite will be mailed to you via FedEx ground. You will receive a shipping invoice prior to mailing you order. Your design is printed using a high quality printer, and archival inks. Flat printing allows the most intricate details of your wedding paper artwork to be displayed in rich, vivid color. This process is available on our 130# cardstock and handmade paper. With this printing method, we can only print onto paper and envelopes significantly lighter in color than the ink you choose. For example, we cannot print slate grey ink onto a merlot envelope. If you select slate grey ink and merlot envelopes, your return address and reply address will be left blank. Furthermore, flat inks are non-metallic, and not textured - they lie flush against the surface of your paper. A process typically reserved for printing on handmade paper or fabric, screen printing is a great way to bring your invitation design to life on a variety of textures. An image of your wedding invitation is created using emulsion on a mesh screen, ink is applied to the screen by hand, forcing the ink through the mesh and onto your wedding paper or fabric. This process is reserved for your handmade paper. Screen printing is beautiful way to bring metallics to handmade paper. With this printing method, we can print light colors onto dark paper. If you select this printing option, your reply address and/or return address will also be screen printed. A centuries-old print method that uses plates and a matte ink to press your design into your wedding paper, creating a debossed impression of your design that you can feel as you run your fingers across the letters. This process is available on our 220# cardstock and handmade paper. If you select this printing option, your return address will also be letterpress. However, with this printing method, we can only print onto paper and envelopes significantly lighter in color than the ink you choose. For example, we cannot print slate grey ink onto a merlot envelope. If you select slate grey ink and merlot envelopes, your return address and reply address will be left blank. Similar to letter press, foil printing uses a plate and heat to impress your design into a metallic foil on your paper, leaving a shiny, debased impression of your design. his process is available on our 220# cardstock and handmade paper. If you select this printing option, your return address will also be foil printed. With this printing method, we can print light colors onto dark paper - yay! Approximately 90# paper, handmade cotton rag, with deckled, feathery edges, visible texture and perfect imperfections. *Due to the handmade nature of this paper, you can expect some slight variances in color, shape, and texture - but this in lies the true beauty of handmade. 130# sturdy, yet pliable, bright white paper with a smooth finish. 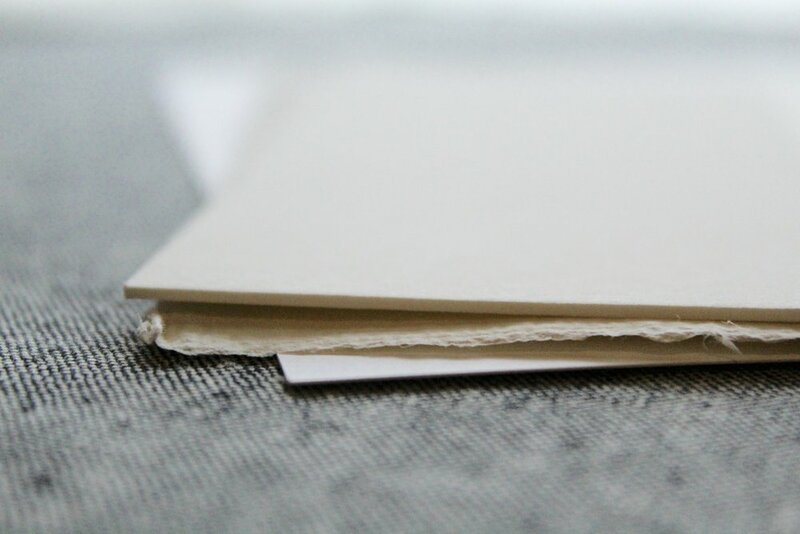 220# firm cotton paper, with a soft, eggshell finish. This paper comes in ivory, but can be substituted for white at your request. **Flat printing and letterpress printing not available on Forest, Slate, Black, and Merlot envelopes. If this option is selected, your reply envelope and/or return address will be left blank. Calligraphy addressing, however is available on ALL envelopes. Hand drawn floral elements on corresponding pieces will coordinate to the crest you select on your main invitation. Shipping costs are not calculated when your order is placed. Once your order is completed and ready to ship, you will be sent an invoice for your estimated shipping costs, payable before your paper goods are shipped. If you prefer a faster shipping speed, please let me know. All orders are shipped via FedEx Ground. Please allow 3-5 business days for you order to arrive, or 8-10 business days for international orders. W H O I S H O S T I N G ? *If the bride's parents are hosting, and she shares the same last name, it is traditional to use the bride's first and middle name, and the groom's first and last name. For more information regarding wording etiquette, please visit this guide. The date, year, time, and location (venue name, city, and state) of the ceremony. The date by which your guests' reply is needed.